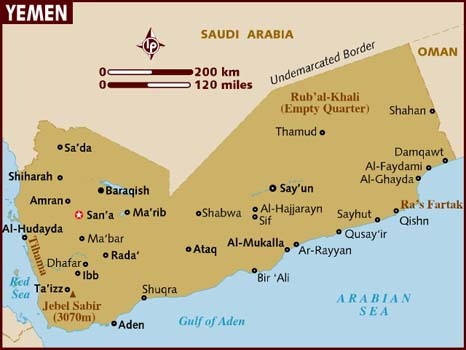 ADEN –Yemen's government ordered tighter tax collection at ports under its control Tuesday as it began preparing its 2019 budget with no end in sight to nearly four years of war. The government had approved just one formal budget since rebels overran the capital Sanaa in 2014, seizing most of the rest of the country and forcing President Abedrabbo Mansour Hadi to flee into exile. After a meeting in its interim headquarters in second city Aden late on Monday, the government announced the formation of a committee to draw up a 2019 budget, which is again expected to run a huge deficit. This year's budget, approved in January, projected a deficit of $1.3 billion. There has been no official update since then on the state of the government's finances but the actual deficit is expected to be far higher. The value of the Yemeni rial has dived more than 36 percent since the start of the year, despite a $2 billion deposit in the central bank by Saudi Arabia aimed at shoring it up. The rial has now lost two-thirds of its value since 2015, when a Saudi-led military coalition intervened in support of Hadi's government triggering a gruelling war of attrition. The collapse in purchasing power in an impoverished country long dependent on imports for basic foodstuffs has left most of the population dependent on humanitarian aid -- and nearly 14 million at risk of famine. The government levies taxes and duties totalling 10 percent on goods entering areas under its control but the war has made collection uneven. The cabinet approved measures to improve collection "on all taxable imports at all land, sea and air ports in liberated areas," the government-run Saba news agency reported on Tuesday. The move came as fighting flared around the Red Sea city of Hodeida -- home to Yemen's most important port -- which has been under rebel control since 2014 but has been under assault by government and coalition forces since June.There was a brief lull in the fighting as the United Nations attempted to convene peace talks in Switzerland in early September but it resumed when that effort collapsed. Aid agencies have warned that an all-out battle for Hodeida, the entry point for nearly all UN-supervised humanitarian aid, would trigger heavy civilian casualties and a major famine.